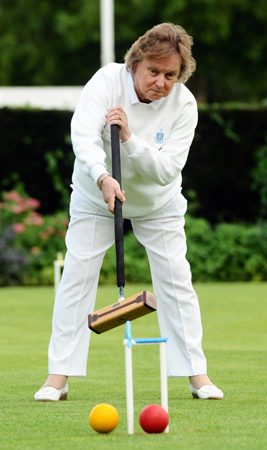 PCC Blue rounded-off their Southern Federation Handicap League program with a draw against High Wycombe on Friday. Star of the show was Alex Earnshaw who's second match double-win in a row saw his hadicap reduced to 6 - Well done Alex! 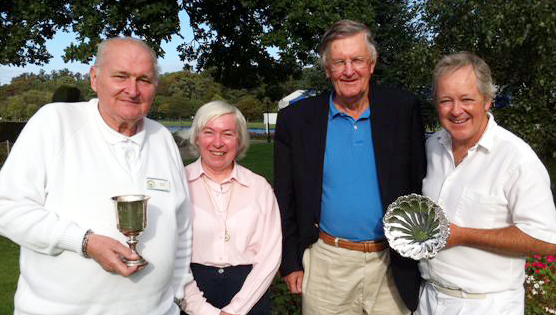 Don Rutherford & Anne Attfied were paired to gether for the first time and won their doubles and captain Mike Fensome & Alex shared theirs. Assoc Final held-overin the ballence! and delicatly poised thanks to a water soaked lawn 2 - Your committee are in talks with council about this on going problem. 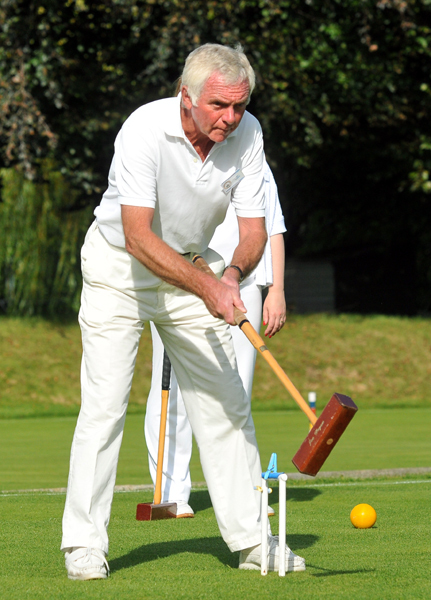 Organiser Robin Morrell reports that Croquet came off second best in the annual duel game activity losing out 22-28 yesterday. Not surprisingly each team won their respective games: The bridge ended 8-17 and the croquet 14-11, on the only fine day in three otherwise wet ones. The 'Senior Guard' saw off the 'Young Pretenders' this eveining when Anne Attfield & Cynthia Hutton beat Ian & Delia Norris in three games to reach the first final of our new 7+ Doubles Competition. Ann has not featured in Club final for three years and Cynthia has to look back to 2001 for her most recent experience. And Cynthia provides an even longer link with the past having won a Club cup as long ago as 1993! - Jolly well done ladies! 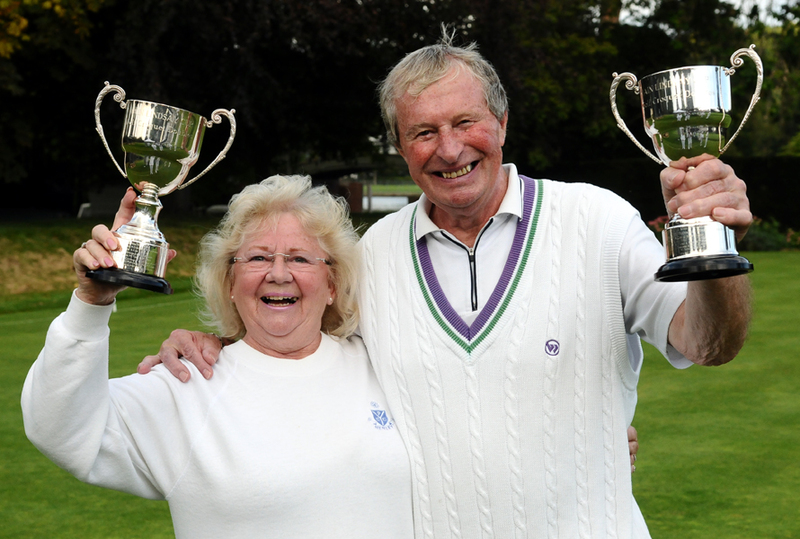 Sylvia Thomson & Mike Fensome sprang a big surprise to lift the Iain Lindsay Cups today and were hughly popular victors. Starting as 6th seeds they won their group ahead of 3rd seeds TJ Johnasen & Pat Eades and then stayed unbeaten to repeate that victory in a closely contested final. Proving the power of positive thinking, Sylvia & Mike started to believe in themselves over the lunch break and they then accounted for the Heather Masheter & Dorothy Elliot pairing before sqauring up with 2nd seeds Pam Mead & Mike's misses Helena (Fensome). Mike & Sylvia's steady play and saw them not only match their fancied oponents hoop for hoop but eventually pull clear to (excitedly) claim the final berth. In the other semi, top seeds Frances Colman & Chris Roberts fell victims to a couple of unforced errors and some very solid positional play, and particularly two promotions from TJ & Pat. And so to the grand final and a tense affair it was, right up to the turning point at hoop 12 when Mike pulled of a 'clearance and nestle in the hoop' shot worthy of any champion. With Sylvia poised to knock her partner through with the next shot, TJ had a jump to save the match but just dragged Mike through. It was lovely that Pauline Wilding was on hand to present Iain's Cups to the two first time winners and soon there was bubbly from the Silverware on the Club terrace. There followed the promise of a new frock for the presentation dinner and general agreement that we had all had very enjoyable day and thankfully no rain either! (1) The coverted Golf Open Doubles title (and the Spensley Cox Salvers) were won by top seeds Frances Colman & Chris Roberts as dusk became twilight this evening. Always in control of the first game (they took that 7 - 5), they were made to work harder by the Raymond Wood & TJ Johanesn pairing for the second, and a much protracted, 7 - 6 victory which was a real nailbiter. (2) Two names that litter the Assoc. winners trophies were at it agin today when Elixabeth O'Dair & Helen Walker finaly saw off the spriited challenge presented by Harry Midgley & Michael Wiles in the closing hour of their suspended Advanced Doubles Final that went into extra time an a a deciding 'Golden Hoop'. (3) The Autumn Singles Tournament got underway today with everyone playing two block games out of four. Our newest member Anthony Dix (handicap 1.5) took his first bow and duly won both his games in the tournament that lasts all weekend. (1) The Association High Bisquers Tournament was wrapped up yesterday and Michael Wiles emerged as winner. Brian Bucknall had devised a series of doubles matches where each of the four contestants swapped partners and all combinations played each other. All had embarked on their first ever AC event and Nina Cox, Pauline Wood & Bruce Mason all enjoyed themselves as much their winner. Michael was undefeated throughout and lifted the Zia Sterling Trophey for the first time that it has been contested in four years - Well done Michael! (2) The main tournament event reached it's climax this afternoon (Sunday) with the final between the two block winners Peter Honey & Chris Roberts. Peter was a clear winner in his block but Chris had to sneek through by virtue of four more hoops scored over Anthony Dix and Brian Bucknall after all ended tied on three game victories. In the final, Chris got off to a good start and never looked back playing by far his most acomplished game yet. Peter struggled to get going and his form of yesterday provided Chris with a constant worry, but he went on to win eventually. (3) It was a good day for Chris who had taken the 'season-long' Block Competition Final against Helen Walker earlier in the day, and reduced his AC handicap to 11 by the end of a birthday weekend to savour. Michael & Chris are pictured here with Helen (a former winner of both trophies) and organiser Brian Bucknall. It was honours even at 8 - 8 when Watford made their annual trip to Phyllis Court today but with only seven players. 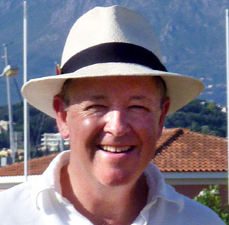 With the visitors fielding three of their National Inter-Club Shield team, our side, captained by Raymond Wood, must have done well but, as yet, deatils are still to arive at this web site. And Raymond Wood (near left) finally secured the 5+ Singles Cup after falling at the final hurdle on no less than four previous occasions. All the games this eveing were fairly one sided affairs with Charlie seeing off Chris Roberts who crumbled away meeky after disastrously hitting a wrong ball at the second hoop of this deciding game. The Open Final had been suspended for five days, poised level at one game all, when Charlie and Chris ran out of time to complete last week. Their overall scorecard read 2 - 7, 7 - 6, 7 - 2. Raymond too had an easier task than he might have imagined when he encountered a strangly out of form Mike Fensome and won easily 7-2, 7 - 1. Pauline Wood & Keith Wilson saw off the stiff challenge posed by Joanna Iyer & Ian Norris to become the second winners of the 'Hugh's Mallett' Drawn Partners tournament today. Coming through a tough group, having a rushed lunch and playing all day in lovely, but very hot conditions, the experienced pair used all their 'nouse' to defeat thier opponents in the final. Keith used the worn rabbitt runs very well to nestle in the hoops and the pair came from behind to seal victory 7 - 5. Still in his first season propper, Ian again showed great potential and Joanna did really well in this her first tournament. Other pairs to catch the eye were Michael Wiles & Raghu Iyer, and evrergreen Anne Attfield with her novice partner Delia Norris. 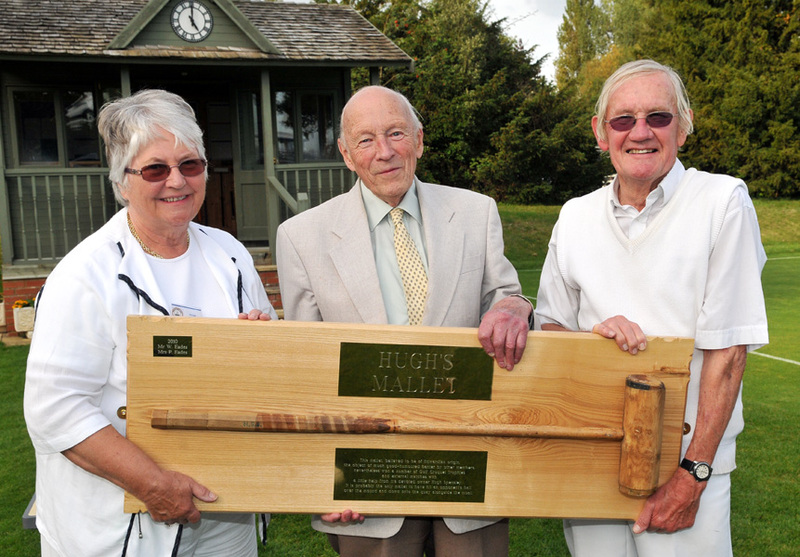 Guest of Honour Hugh Spencley watched the final 90 minutes play and presented 'his mallet' to the happy victors, with the story that he had played with it for 70 years, but only after his father had finished with it, and father had bought it second hand! Here are link buttons to all three of this seasons Drawn Partners Tournamnets. Your editor has been on holiday and .....well it certainly has all happend in the last week or so! So, were to start...? Chronologically, Michael Wiles beat Dilys Earnshaw to win a place in the first 7+ Singles Final but then lost the next day to Ian Norris. Ian is to be roundly congratulated for winning a Cup in his first full season - Really well done Ian! 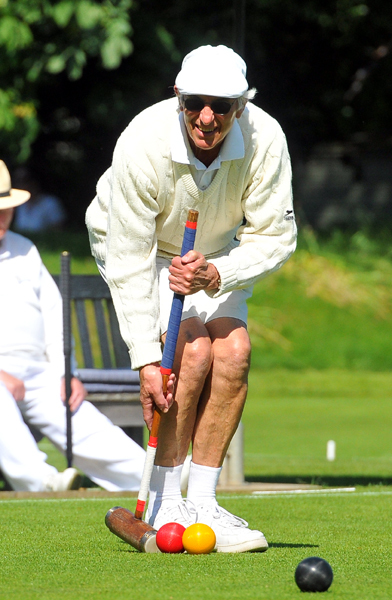 Staying with Golf Croquet, the old Vivian Thomson - Raymond Wood axis returned to form to take the 5+ Doubles title but were pushed to three very tight games by John Chalfont and another new boy Hugh Crook. The previously dubbed 'Senior Guard' of Anne Attfield & Cynthia Hutton couldn't live with the Rosie Richardson - Pat Eades pairing and the latter took the new 7+ Doubles at a canter. 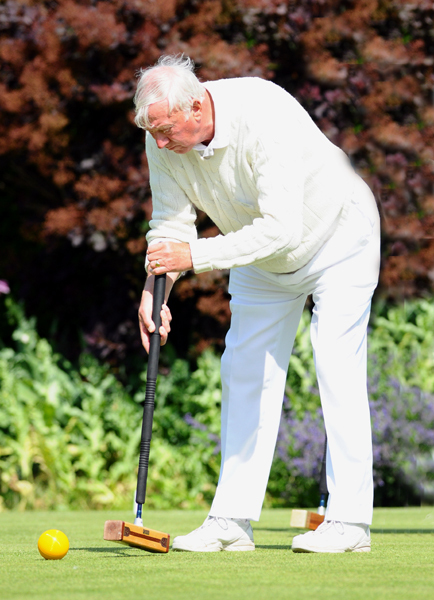 The last two Accociation Cups were decided in the last week as well, with Peter Honey taking the senior competition crown (the Advanced Play) and it was good to see Keith Noble returning to the form of old to take the Handicap title. 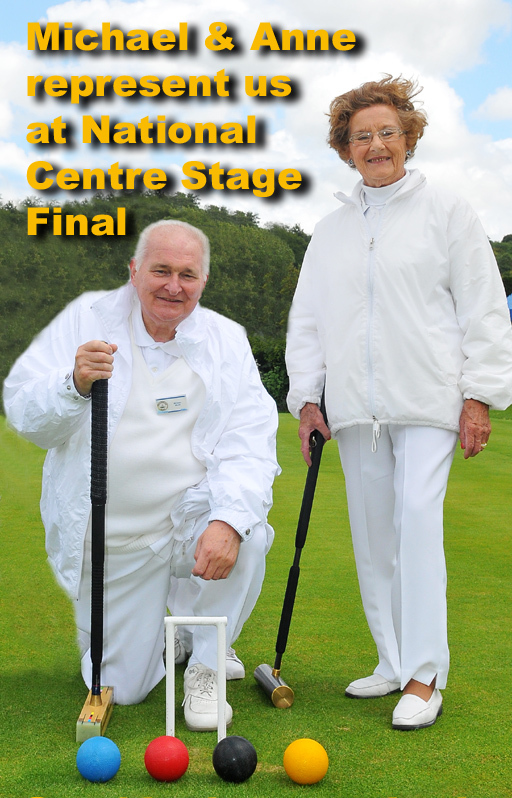 Away from the Club, in Golf, Michael Wiles and Anne Attfield took their bow as our representatives at the National Center Stage Final at Northampton. Michael won 2 out of 4 games and Anne just the one, as the sloping and bumpy lawns frustrated but failed to hamper their enjoyment of this, their first 'outside' event. There were flahses of individual success for our our county team, with Charlie von Schmeider apparently taking UK no. 7 Howard Cheyne to the cleaners 7 - 0 in the Inter Counties Tournament, but seemingly match victories were in short supply for Oxfordshire as TJ Johansen, Helena Fensome and other club's representatives toiled away. 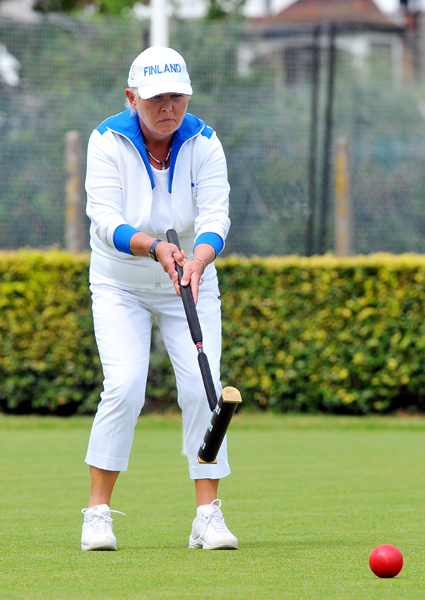 Further afield, much further actually, Frances Colman & Chris Roberts flew the Phyllis Court flag at the Greek Association Croquet Open on Corfu. The pair were beaten by one hoop to the Doubles Title and then Chris beat Frances in the semis of the Singles, before going on to win the Final convincingly. A huge olive wood trophey raised eyebrows from security staff at the airport but luckily didn't constitue excess bagage! Frances won a special award for her paitent coaching and general enthusiasm towards the local 'Corfiot' players with whom a sociable Golf Croquet Tournament was played at the end of a lovely week in the sun. 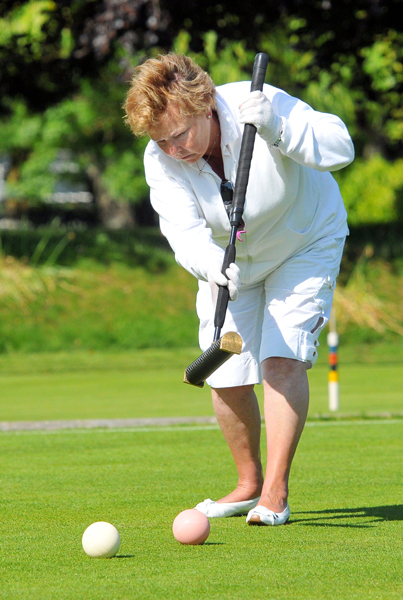 Winchester wrapped up the SCF Golf Croquet Level Play League title with a play-off win over Ryde today by 7 games to 2 today. And yesterday, the inaugural Handicap League final produced Littleton as winners over Blewbury by the same score. 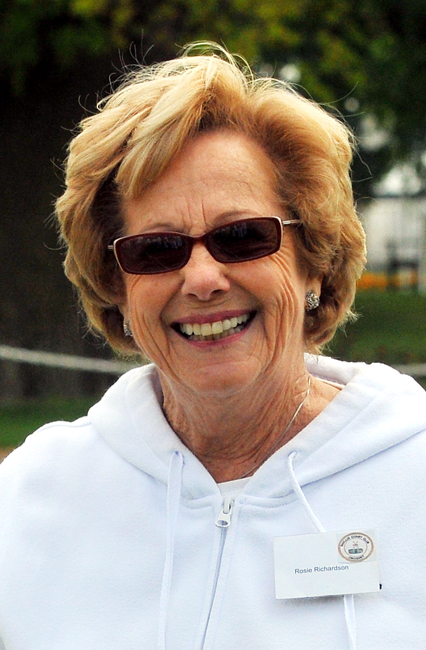 Phyllis Court had to be content with representation on the sidelines of this latter final only as Frances Colman and Chris Roberts donned their Federation hats as referee and manager. Our teams had mixed seasons with the PCC Level team finishing third in their League and our handicap teams PCC White & PCC Blue ending up 4th & 5th in their league respectivly. 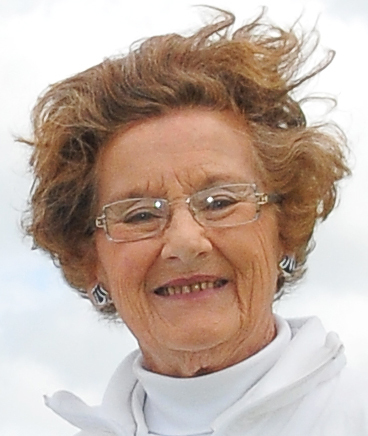 Wednesday 12th October - Helena reduces her handicap down to TWO! Helena Fensome geared up for her trip to New Zealand for the Women's World Championships by getting her handicap reduced down to the '2' mark following some favourable results in the Sussex Open earlier this month. Really well done Helena! The news filtered through to this page when she and fellow WWC contender Pam Mead posed up for some publicity photographs this week. Those pictures will be revealed here next week - but as a tease 'think Britannia! 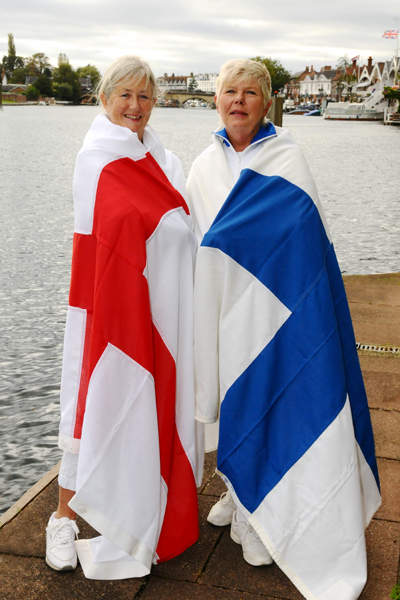 It was 'flag day' at PCC last week when Pam Mead and Helena Fensome geared up for The Womens' World Championships which are being held in Bay of Plenty region of New Zealand from 19th November. The Official WWC web site names Helena, who is again representing her native Finland and Pam, an English rose of course, as 'wild card' picks for the tournament that sees them up against the best in the world as you would expect. And just like the men's game that means the Egyptians, and top of the pile is World Champion Iman El Faransawi who leads a strong team of eight compatriots. There are also nearly 30 players from New Zealand and Australia and 56 competitors in total from as far afield as the USA, Canada, South Africa, Scotland, Ireland and Wales taking part in the week long tournament. Helena took part in the recent World Championships at Hurlingham and Surbiton, and she enjoyed the experience enormously, but for Pam this will be a first outing as a representative of her country and it is bound to be a proud moment.